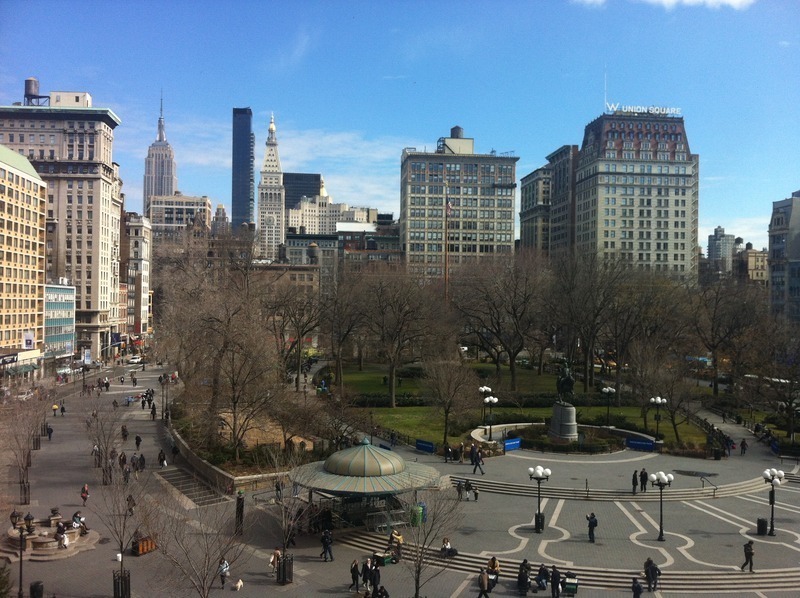 Do we love Union Square? Oh yes, we do! It is such a great place to be. Gateway to downtown and a perfect start for a stroll through SoHo. Union Square is a pretty large square (or a small park) that can be crowded and noisy but still feels quiet and relaxed. There is lots to do around it. Shopping, to name one. The subway gets you to the center of the square, and then what? Well, first get a coffee in one of the many places that surround you. Then go to a bench near the doggierun where New Yorkers let their dogs out in a sort of a big playpen and read the paper while their dogs are playing with other dogs. Fabulous to see. Next to you people will be doing some reading, homework, checking their agenda or whatever. Parents or nannies will be walking around watching their kids play in the playyard. And while you’re sitting there, think of where you’re heading next. Will ’t be the big Barnes and Noble bookstore, with lots of books and where there’s often a celebrity promoting his/her book? Or to The Strand, a secondhand bookstore which we think you should just go and see even if you’re not into books. Or perhaps Sephora’s? Which you’ll find all over New York City but is now in the neighbourhood. Enough food for thought on your Union Square Park bench. You can also join a rally there. Don’t let it scare you, but this is a popular place for demonstrations. Before you head for the shops, take a quick peak at the Union Square Green Market, where in the high season, some 140 farmers, fishermen and bakers from New York sell their produce. And when you cross the street you’ll find a Whole Foods Market. A giant supermarket that sells biologic dynamic products and is big in sustainability. They present their products in a way that makes your mouth water. And at the check out lanes, also something you should go see, they always sell some great shopping bags, for only 99 cents. Those might come in handy later. We also always take a quick look inside Paragon Sports, a giant sportinggoodsstore which does not seem that big but really is. And, if you’re into home decorating then ABC Home is a must aswell. A huge store with beautiful stuff. We almost forgot to mention the Flatiron Building, at the corner of where Broadway crosses 5th avenue into Madison Square Park. Built in 1902 as one of the first skyscrapers in the world. It is shaped as a pieslice or flat iron. Close to Flatiron you'll find Eataly, such a nice place for coffee, lunch, drinks or dinner. And from here…..? You walk right into SoHo!